Transgenic animal technologies and the ability to introduce functional genes into animals have revolutionized our ability to address complex biomedical and biological questions. This well-illustrated handbook covers the technical aspects of gene transfer — from molecular methods to whole animal considerations — for important laboratory and domestic animal species. It describes methodologies as employed by leading laboratories and is a key resource for researchers, as well as a tool for training technicians and students. 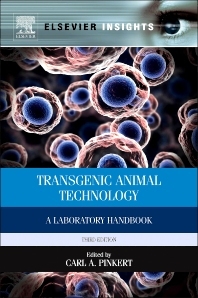 This second edition incorporates updates on a variety of genetic engineering technologies ranging from microinjection and ES cell transfer to nuclear transfer in a broad range of animal modeling systems. Students, postdoctoral fellows, and researchers at academic and industrial/agricultural laboratories using non-traditional transgenic models in such areas as molecular and cell biology, developmental biology, neuroscience, pharmacology, biophysiology, cardiology, oncology and genetics. Transgenic animal production focusing on the mouse model. Transgenic animal production using DNA microinjection. Factors affecting transgenic animal production. Gene targeting in embryonic stem cells I: History and methodology. Gene targeting in embryonic stem cells II. Conditional technologies. Production of transgenic laboratory and domestic animal species. Production of transgenic swine by DNA Microinjection. Production of transgenic ruminants by DNA Microinjection. Production of transgenic non-human primates. Retrovirus-mediated gene transfer into oocytes. Vector design for transgene expression. PCR optimization for detection of transgenic integration. Control of gene expression (from standard gain/loss of function to anti-sense to PNAs). Enabling technologies: Cryopreservation of gametes. Enabling technologies: Embryo culture considerations. Databases, Internet Resources and Genetic Nomenclature. Dr. Pinkert joined the University of Alabama (UA) in 2013 where he serves as Vice President for Research and Economic Development, and where he is a tenured Professor in the Department of Biological Sciences in the College of Arts and Sciences. He earned his Ph.D. from the University of Georgia and was a postdoctoral fellow at the University of Pennsylvania. For over 30 years, his research revolved around animal modeling and transgenesis. He has published extensively on transgenic modeling, reproductive biology, and embryology of laboratory and domestic animals. His laboratory developed a number of enabling technologies for the genetic engineering of both nuclear and mitochondrial genomes, as well as mitochondrial modeling strategies to address human developmental and metabolic diseases. He served as an editor of Transgenic Research on the editorial boards of five others. His research was funded by NIH, USDA, NSF, private foundations and industry. He was a Sigma Xi national lecturer from 1993-1995 and a recipient of the 1997 Doerenkamp-Zbinden Foundation Research Prize (awarded for biomedical research that significantly impacts on the welfare and well-being of animals used in research). He was elected a fellow of the American Association for the Advancement of Science (AAAS) in 2011.